← Cinemagraph by Nokia, Waving Idiot. Thanks! Had this problem also. Very frustrating when you’re cleaning out your download folder……. Only works for Win8 Professional. Home edition can’t access the group policy. Argh. You can probably do this via the registry too, if you work out what feel free to share! Hi i am having same issue but with adobe file not with folder. i Hit Win+R, type gpedit.msc in the Run window and click OK. The link to the microsoft technet discussion has a registry entry that should work for you. It is referenced near the end of the page. You could try creating it? I have the home edition of Windows 8 and when I enter gpedit.msc into the Run field, it doesn’t find anything. How else can I navigate to the User Configuration section? I’ve tried doing a broad search for it and not finding anything. This worked for me (Windows 7 Home Premium)! Make sure to set the dword to 00000001 (not just 1). -Sorry about that. I am finally able to move/rename folders without moving the subfolders first. What a pain that was! Okay, so what I did now is to add the folder in the registry (chose the \Windows\Explorer one) by creating a .reg file and running it. Hope this helps. Glad to hear that worked, thanks for letting us know. Is that still there, or does it have a different value? This was my main problem with windows 8. Today i got annoyed enough to try find out why it can’t do something simple like move stuff from one folder to another on the same hdd without throwing an error every folder i need to move. never had that problem with vista unless i genuinely had something open in the folder i had opened myself. this was getting quite problematic as i have a download folder and i archive stuff from there into their right folders. W00T! Perhaps add a little more detail in your post (e.g. the instructions AJ posted in the comments). 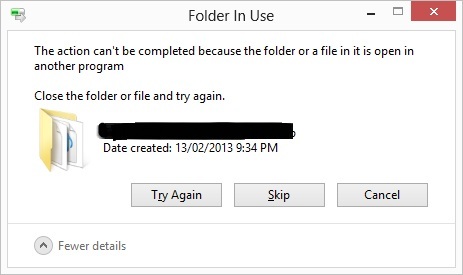 I usually hit this problem when I try to delete a folder out of my downloads folder. Thank you. I’ve been searching for a solution to this issue. After going to a handful of sites with no luck I finally found someone who knew how to solve it. So frustrating, Microsoft at its best. I also tried searching through MMC and cannot find the place I need to be. Can anyone break this down for someone who obviously isn’t as tech-savvy? Are thumbs.db files still being generated? anyone else find this totally ridiculous and completely asinine? State of the art, high tech windows machine, the latest and the greatest, and I can’t move a folder from one location to another without having to pat my belly and rub my head. Totally insane…. It ‘should’ be disabled by default, and then only enabled if you have older systems accessing it. For most companies, at the time of Windows 8 release still had XP machines or worse, and it was probably less hassle to leave this on. I think I have done what you said, but isn’t working. Can you give a screenshot of what this reg entry may look like? I am on the fence regarding an iMac, this is a huge push over. Don’t go to the dark side Greg! I’ve added a screenshot for you on the bottom of the article. Make sure you’ve spelt the name DisableThumbsDBOnNetworkFolders correctly too. Sorry, it is working. I had a file open. Thanks Adam. Finally got a solution that works – and it took a fellow Aussie to provide it. Good on ya! Where in Aus are you? Was it a Windows update? Strange, my PCs are fully patched and I haven’t noticed it. Is the registry setting still correct? Is it because all folders are synced with my OneDrive? You’ve synced your entire hard drive with OneDrive? Not the entire drive. Just all the folders I access daily for business. I use a CAD program that leaves 2 small files in each folder (for back up and log), I found that when I delete those, it works better. I did have one folder that was still not moving, so I had to move all contents and recreate. Each folder contains an Excel file that has a link to a non-existing file also (I cannot break that link!). I will see how it works from now on. Thx. While I figured out a different reason why the files were not getting deleted, I already tried this and disabled my thumbnails. Please somebody tell me how to bring back the thumbnails preview. I looked on the net but was unable to bring it back. If you just want to undo the above, change the registry setting back to 00000000 instead of 00000001. All it’s doing is turning thumbnails off or on. Then it’s something unrelated to my post sorry. I hate to say it, but if it gets too hard and you really miss it, maybe backup/format/start again. Thanks. Not much problem without it. ——- ”Hit Win+R, type gpedit.msc in the Run window and click OK. The Local Group Policy Editor will be launched. but it wouldn’t recognise the gpedit.msc. Really frustrating, in order to move folders by dragging, cutting pasting etc I have to close down the window repeatedly, after about 2 folder moves the message box ‘folder in use’ returns. Try saving the quoted area under ‘Update 2’ of my blog post into a file called folders.reg (copy and paste the full quoted text into notepad and save that file). Then run the folders.reg file by double clicking it, and it will update your registry. That will change the setting and hopefully fix it for you. Edit the registry if you don’t have professional. Not sure if it works out the same, but I can now edit and move folders without waiting for the pointless 3 minutes. If problems persist, I’m definitely downgrading. I wanted to give Windows 8.1 a chance, but I’m very close to just giving up. There’s no reason I should have to constantly find new workarounds to things that work perfectly on Windows 7. Thank you so much!!! This was doing my head in. Thank you so much for your tutorial! Unfortunately, none of these solutions work for me (Windows 8). I cannot find the Administrative Templates from the Start menu or Search, and when I try to run gpedit.msc, the computer says that Windows cannot find ‘gpedit.msc’. I also tried to clear the temp file, but I still get the stupid dialog box… Anybody has other ideas? Adam, Thank you so much for your help. I tried that and got the following error message: ” Cannot import C:\….folders.reg: The specified file is not a registry script. You can only import binary files from within the registry editor”. Any idea? Adam, long time, since I posted, I apologize about that. The trick you gave me didn’t work either unfortunately. However, I read somewhere a couple of weeks ago that turning off the preview panel would stop that error message. And it did! Haven’t had a problem since!! Thanks a lot for all your help! No problem and appreciate you posting back to share. Hopefully this helps someone else with the same problem! Thanks, Adam. Very useful fix. Happy New Year! I have the same problem running Windows 8.1. When click on a folder it shows as a thumbnail in OneDrive(ie does not open as would expect). same issues as above deleting or moving files state “open in another application” so can’t proceed. 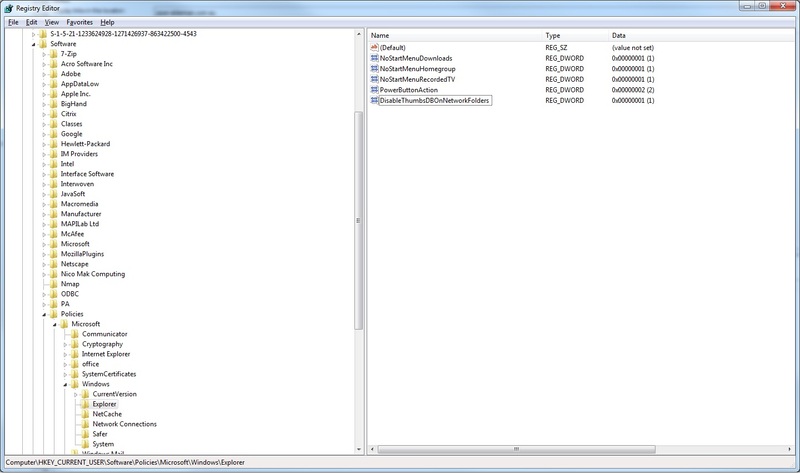 Registry Editor is build 6.3. In Current User Software policies there is no key for File Explorer and Win+R, type gpedit.msc does not produce anything so cant get to Administrative Templates. A real nuisance this as still not corrected with the latest Windows updates? I successfully managed to crack the problem (windows 8.1 64bit) also by adding a new key under policies\Microsoft\windows\explorer. Then creating a new Qword string value under the new key explorer “DisableThumbsDBONetworkFolders” setting it to 1. Great work and thanks for sharing the details – I thought that would work, but good to know for sure! Thanks for the fix! This has been driving me crazy!! I have come so close to going back to Windows 7 because of this….you saved me a big headache. Thanks again! Will this remove all current .db files ? or will it just prevent the creation of new .db files? when using the Regedit fix, create ‘new key’ to make the folder, add the name. then create new ‘dword 32bit’ for the file. when modifying binary data the file looked like this 0000 00 00 00 00 …. change it to 0000 01 00 00 00 …. It shouldn’t remove existing .db files. 1) In File Explorer click on the “View” tab and enable “Item Check Boxes”, by placing a check mark in the item box next to it (yeah….uh, over there on the right side towards the top….you got it.). From now on, whenever you highlight a file, you will see an empty check box next to it. 2) To delete the file (or folder…whatever) simply click on the file to be deleted and put a check mark in the empty box next to it. 3) Now either select “Delete” from the right click menu (right mouse button) or from the “Home” tab in File Explorer. That did not do it for me. I still get the same message about it being open in another program. That did not work for me either. Still same message that it is open in another program. Wow, I didn’t think I’d ever find a fix for a problem that no one else I talk to seemed to be having. Thanks a bunch. So any more ideas ? I tired every one of them mentioned in the article and the comments . I am using Windows 8 , and home version (dont see explorer files in regedit). I think I just switch to W10 .. This is exhausting trying to fix. I’ve read through your tutorials and followed everything and gained a fair bit more of an understanding of what’s happening, but I’m still having a similar problem as someone else.. I realize that I must have the basic Microsoft 8 so I started by installing gpedit.msc. Once there inside the Group Policy Editor I found my way to “Windows Components”, however I could not find “Files Explorer”, it had “Windows Explorer”. I went into that hoping it to be the same and enabled the “Turn off caching of thumbnail pictures”. However, that did not fix the problem of trying to move one folder into another (I haven’t opened that particular file/folder in a year so I should not have that problem). So then I tried to go through the Registry Editor, I followed your procedure until I got to the Microsoft>Windows>Current Version and then I just have Internet settings; so once inside “Current Version” instead of having “Explorer” and then “Advanced” i have 2 folders inside being “5.0” and “Cache”. So i just seem to have separate and yet the same problem as everyone else but just a little different. I’m sure its a simple solution, I just haven’t used computers in 10 years and this simple problem is killing me. I have Windows 10 Home I can test some things against. I’m not sure why you’re only seeing those two entries – could you show a screenshot? Also if the path is correct, you should be able to create the correct folders that are missing and have it work. You can save the text from Update 2 above – everything in the grey box, and put it into a settings.reg file, and run that to see if it helps. Truly feeling like a newbie now. I tried to screen shot both of Group Policy Editor and the Registry Editor but cannot seem to send them through this reply. I then tried to create folders in the Registry Editor to copy and paste that text to make it work but hit another wall. If i right click to anywhere under or on the “Explorer” folder i get these options under “new”: Key, String Value, Binary Value, DWORD (32-bit) Value, QWORD (64-bit) Value, Multi String Value, Expandable String Value. I think I’m having a “User” error! ie. me! If you can clarify at all or let me know if I’m just not in the right area, please feel free to be brutally honest. Brilliantly explained, and thank you so much! In my business I create a folder in an Open Bids folder, and when we go under contract, I move it to a client folder. This issue drove me crazy. I appreciate the research you did and the well documented post. Bless you! Glad this has helped you out Kalen, and appreciate the feedback! 12/31/18 Hey Just wanted to pipe in and say still dealing with this in 2018!! Thanks for your help, because of this write up I was able to fix my issue!